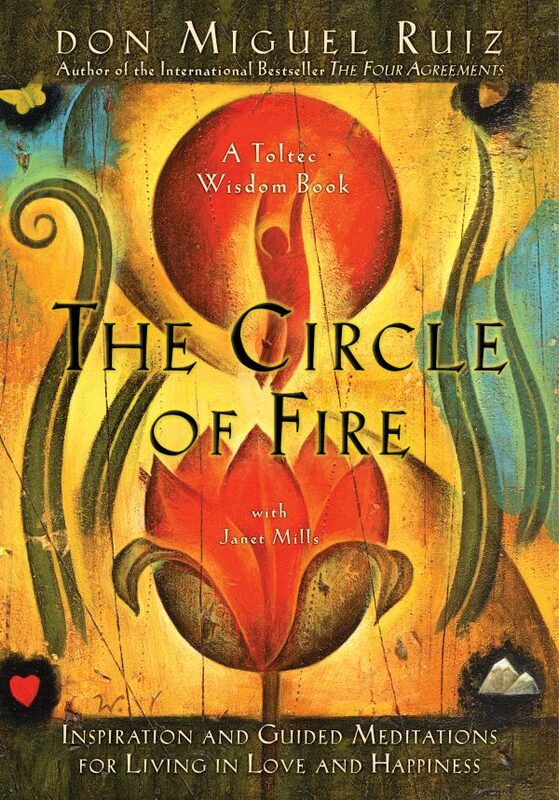 In The Circle of Fire (formerly published as Prayers: A Communion With Our Creator) Ruiz inspires us to enter into a new and loving relationship with ourselves, with our fellow humans, and with all of creation. Through a selection of beautiful essays, prayers, and guided meditations, Ruiz prepares our minds for a new way of seeing life, and opens our hearts to find our way back to our birthright: heaven on earth. The result is a life lived in joy, harmony, and contentment. In my teachings, “The Circle of Fire” ceremony celebrates the most important day of our lives: the day when we merge with the fire of our spirit, and return to our own divinity. This is the day when we recover the awareness of what we really are, and make the choice to live in communion with that force of creation we call “Life” or “God.” From that day forward, we live with unconditional love in our hearts for ourselves, for life, for everything in creation. Every human is an artist, and our greatest art is life. Humans perceive life and try to make sense of life by expressing what we perceive with words, music, and other expressions of art. We perceive life and then create a story to justify, describe, and explain our perception and emotional reaction. All humans are storytellers, and that is what makes us artists. Everything we believe about ourselves is a story we create that is based in reality, but is just our point of view. Our point of view is based on our experience, on what we know, on what we believe. And what we know and believe is just a program; it is nothing but words, opinions, and ideas we learn from others and from our own life experience. Humans perceive truth, but the way we justify and explain what we perceive is not truth; it is a story. I call this story a dream. The human mind mixes perception, imagination, and emotion to create a whole dream. But the story doesn’t end there, because every mind of every human mixes together and creates the mind of the planet Earth — the dream of the planet. The dream of the planet is the dream of all humans together. We can call it society, we can call it a nation, but the result of the creation of the mind, individual and collective, is a dream. The dream can be a pleasant dream that we call heaven, or it can be a nightmare that we call hell. But heaven and hell only exist at the level of the mind. In human society, the dream of the planet is ruled by lies, and fear is the result. It is a dream where humans judge one another, find one another guilty, and punish one another. Humans use the power of the word to gossip and to hurt one another. Misuse of the word creates emotional poison, and all that emotional poison is in the dream. It goes around the world, and that is what most humans eat: emotional poison. The dream of the planet prepares newborn humans to believe what it wants them to believe. In that dream, there is no justice; there is only injustice. Nothing is perfect; there is only imperfection. That is why humans eternally search for justice, for happiness, and for love. For thousands of years people have believed there is a conflict between good and evil in the universe. But this is not true. The real conflict is between truth and what is not truth. The conflict exists in the human mind, not in the rest of nature. Good and evil are the result of that conflict. Believing in truth results in goodness; believing in and defending what is not truth results in evil. Evil is just the result of believing in lies. All human suffering is the result of believing in lies. To become aware of this is the first thing we must do. Why? Because this awareness will guide us to truth, and the truth will lead us to God, to love, to happiness. The truth will set us free from all the lies we believe in. But we have to experience the truth to know the truth; we cannot put the truth into words. As soon as we start to talk about the truth, as soon as we put it into words, it is no longer the truth. We can experience truth, and we can feel truth, but when we make the story, that story is only true for us. For everyone else, it is not truth. Everyone creates his or her own story; everyone lives in his or her own dream. To recover awareness is to see life the way it is, not the way we want it to be. To be aware is to see what is truth, not what we want to see in order to justify the lies we believe. If we practice awareness, then the time comes when we master awareness. When we master awareness as a habit, we always see life the way it is, not the way we want to see it. Then we no longer try to put things into words and explain what we perceive to ourselves. Instead we use words to communicate with someone else, knowing that what we are communicating is just our point of view. God is here. God is living inside you as life, as love, but you have to see that truth, or there is nothing. You are here to be happy, to live your life, and to express what you are. You were created to perceive the beauty of creation and to live your life in love. But if you cannot find the love inside you, the whole world can love you, and it will not make a difference in you. Instead of looking to other humans for love, we need to align with our own love, because it’s not the love of other humans that will make us happy. What will make us happy is the love we feel for every human, the love we feel for God, for all creation. When the love comes from somebody else, we can feel it and it’s nice, but when we feel our own love, it is the best thing that can happen to us. We live in heaven; we live in bliss. Your body is a living temple where God lives. The proof that God lives in you is that you are alive. In your mind there is emotional poison, but you can clean your mind and prepare yourself for a communion of love with God. Communion means to share your love, to merge in love. And when you pray, it is about communing with the love of God inside you and allowing this love to come out. But if you pray and feel nothing, why waste your time? You need to look inside you and awaken your love. Open your heart and love unconditionally — not because you want love in return, and not because you want to control someone. That is false love. When you love with no conditions, you transcend the dream of fear and become aligned with divine spirit, the love of God, which is the love coming out of you. That love is life, and just like the sun, it is shining all the time. My greatest wish is for all humanity to gain enough awareness to awaken from the dream of fear and use the power of creation to bring heaven on Earth. The entire creation is a masterpiece of art, and just by perceiving the beauty of God’s art, our hearts can be filled with joy and contentment. Use this prayer to increase your awareness of the beauty of all creation, including the beauty of the creation that is you. You are beautiful just the way you are, and when you perceive your own beauty, your emotional reaction is a reaction of love, and you can experience overwhelming happiness. By perceiving your own beauty, you will see yourself in the flowers, the sky, the clouds, the water, and the oceans. But most of all, you will perceive yourself in other humans — in your beloved, in your parents, in your children, in everyone. Please take a moment to close your eyes, open your heart, and feel all the love that is coming from your heart. Let’s join in a special prayer to experience a communion with our Creator. Today, Creator, I ask you to open my eyes and open my heart so that I can recover the truth about my life. Help me to resist the temptation to believe the lies that repress the expression of my life and my love. Give me the strength to resist the temptation to believe the lies of others that only create emotional poison in my heart. Today, Creator, let me see what is, not what I want to see. Let me hear what is, not what I want to hear. Help me to recover my awareness so that I can see you in everything I perceive with my eyes, with my ears, with all my senses. Let me perceive with eyes of love so that I find you wherever I go and see you in everything you create. Help me to see you in every cell of my body, in every emotion of my mind, in every person I meet. Let me see you in the rain, in the flowers, in the water, in the fire, in the animals, and in the butterflies. You are everywhere, and I am one with you. Let me be aware of this truth. Today, let everything I do and say be an expression of the beauty in my heart. Let me be aware of the beauty and perfection in everything you create, so that I can live in eternal love with you. Thank you, Creator, for the power to create a dream of heaven where everything is possible. Beginning today, I will use the power of my love to create a masterpiece of art — my own life. Amen.